Romosozumab (AMG 785) is a humanized monoclonal antibody that targets sclerostin for the treatment of osteoporosis. Romosozumab was originally discovered by Chiroscience, which was acquired by Celltech (now owned by UCB). Celltech entered in a partnership with Amgen in 2002 for the product’s development. In 2016 results from 12 months of a clinical study were reported. Some results from the FRAME and ARCH clinical studies were reported on in 2017. Japan’s Ministry of Health, Labor and Welfare has granted a marketing authorization for romosozumab (EVENITY) for the treatment of osteoporosis in patients at high risk of fracture. Developed by Amgen and UCB, romosozumab is a humanized IgG2 monoclonal antibody that targets sclerostin. The approval in Japan is based on results from the Phase 3 FRAME and BRIDGE studies, which included 7,180 postmenopausal women with osteoporosis and 245 men with osteoporosis, respectively. A biologics license application (BLA) for romosozumab as a treatment of osteoporosis in postmenopausal women at high risk for fracture was submitted to the U.S. Food and Drug Administration (FDA) in July 2016, but additional safety and efficacy data was requested in the FDA’s complete response letter, as announced by Amgen and UCB in July 2017. In July 2018, Amgen and UCB announced that the BLA had been resubmitted. In addition to data from early-stage clinical studies, the original BLA included data from the Phase 3 FRAME study. The resubmitted BLA includes results from the more recent Phase 3 ARCH study, an alendronate-active comparator trial including 4,093 postmenopausal women with osteoporosis who experienced a fracture, and the Phase 3 BRIDGE study. The FDA’s Bone, Reproductive and Urologic Drugs Advisory Committee is scheduled to review data supporting the BLA for romosozumab at a meeting on January 16, 2019. The European Medicines Agency is also currently reviewing a marketing application for romosozumab. Commercial production of cell culture-derived products (for example, protein-based products, such as monoclonal antibodies (mAbs)), requires optimization of cell culture parameters in order for the cells to produce enough product to meet clinical and commercial demands. However, when cell culture parameters are optimized for improving productivity of a protein product, it is also necessary to maintain desired quality specifications of the product such as glycosylation profile, aggregate levels, charge heterogeneity, and amino acid sequence integrity (Li, et al., 2010 , mAbs., 2(5):466-477). For instance, an increase of over 20% volumetric titer results in a significant improvement in large-scale monoclonal antibody production economics. Additionally, the ability to control the glycan forms of proteins produced in cell culture is important. 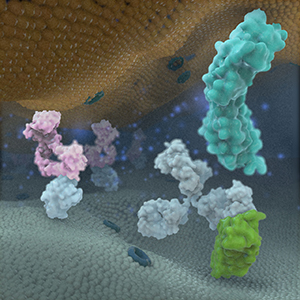 Glycan species have been shown to significantly influence pharmacokinetics (PK) and pharmacodynamics (PD) of therapeutic proteins such as mAbs. Moreover, the ability to modulate the relative percentage of various glycan species can have drastic results over the behavior of a protein in vivo. For example, increased mannose-5-N-acetylglycosamine-2 (“Man5”) and other high-mannose glycan species have been shown to decrease mAb in vivo half-life (Liu, 2015 , J Pharm Sci., 104(6):1866-84; Goetze et al., 2011 , Glycobiology, 21(7):949-59; and Kanda et al. 2007 , Glycobiology, 17(1):104-18). On the other hand, glycosylated mAbs with mannose-3-N-acetylglycosamine-4 (“G0”) glycan species have been shown to impact antibody dependent cellular cytotoxicity (ADCC). Bioreactors have been successfully utilized for the cell-based production of therapeutic proteins using fed-batch, immobilized, perfusion and continuous modes. Strategies, such as the use of temperature, media formulation, including the addition of growth inhibitors, autocrine factors or cyclic mononucleotides, and hyperstimulation by osmolarity stress, have been used to enhance protein production by cells in culture. To the extent that they have worked at all, these approaches have shown only marginal success. As such, there is a particular need for improved compositions for use in cell culture for the production of medically or industrially useful products, such as antibodies. Ideally, such compositions and methods for utilizing the same would result in higher titers, modulated (e.g. decreased) high and low molecular weight species, as well as a more favorable glycosylation profile of the derived products in cell culture. Throughout this specification, various patents, patent applications and other types of publications (e.g., journal articles, electronic database entries, etc.) are referenced. The disclosure of all patents, patent applications, and other publications cited herein are hereby incorporated by reference in their entirety for all purposes. ^ “Statement On A Nonproprietary Name Adopted By The USAN Council: Romosozumab” (PDF). American Medical Association. ^ Quested, Tony (June 7, 2015). “Cream of life science entrepreneurs’ first venture was selling doughnuts”. Business Week. Cambridge, England: Q Communications. Retrieved December 24, 2018. 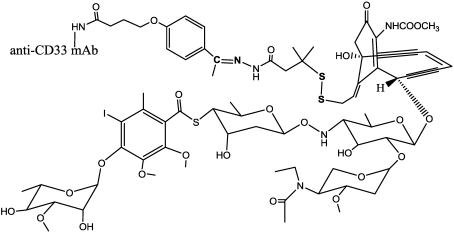 ^ Osteocyte control of bone formation via sclerostin, a novel BMP antagonist. EMBO J. 2003 Dec 1;22(23):6267-76. ^ Cosman; et al. (2016). “Romosozumab Treatment in Postmenopausal Women with Osteoporosis”. The New England Journal of Medicine. 375: 1532–1543. doi:10.1056/NEJMoa1607948. PMID 27641143. This drug was produced by Dyax Corp and currently under development by Shire. Lanadelumab has been designated by the U.S. Food and Drug Administration (FDA) as a breakthrough therapy. ^ Jump up to:a b c Banerji, Aleena; Busse, Paula; Shennak, Mustafa; Lumry, William; Davis-Lorton, Mark; Wedner, Henry J.; Jacobs, Joshua; Baker, James; Bernstein, Jonathan A. (2017-02-23). “Inhibiting Plasma Kallikrein for Hereditary Angioedema Prophylaxis”. The New England Journal of Medicine. 376 (8): 717–728. doi:10.1056/NEJMoa1605767. ISSN 1533-4406. PMID 28225674. Jump up^ Kenniston, Jon A.; Faucette, Ryan R.; Martik, Diana; Comeau, Stephen R.; Lindberg, Allison P.; Kopacz, Kris J.; Conley, Gregory P.; Chen, Jie; Viswanathan, Malini (2014-08-22). “Inhibition of Plasma Kallikrein by a Highly Specific Active Site Blocking Antibody”. The Journal of Biological Chemistry. 289 (34): 23596. doi:10.1074/jbc.M114.569061. PMC 4156074  . PMID 24970892. Jump up^ Statement On A Nonproprietary Name Adopted By The USAN Council – Lanadelumab, American Medical Association. Jump up^ World Health Organization (2015). “International Nonproprietary Names for Pharmaceutical Substances (INN). Proposed INN: List 114”(PDF). WHO Drug Information. 29 (4). Jump up^ Chyung, Yung; Vince, Bradley; Iarrobino, Ryan; Sexton, Dan; Kenniston, Jon; Faucette, Ryan; TenHoor, Chris; Stolz, Leslie E.; Stevens, Chris (2014-10-01). “A phase 1 study investigating DX-2930 in healthy subjects”. Annals of Allergy, Asthma & Immunology. 113 (4): 460–466.e2. doi:10.1016/j.anai.2014.05.028. ISSN 1534-4436. PMID 24980392. Jump up^ “A Single Increasing Dose Study to Assess Safety and Tolerability of DX-2930 in Healthy Subjects – Full Text View – ClinicalTrials.gov”. clinicaltrials.gov. Retrieved 2017-03-24. Jump up^ “Double-Blind, Multiple Ascending Dose Study to Assess Safety, Tolerability and Pharmacokinetics of DX-2930 in Hereditary Angioedema (HAE) Subjects – Full Text View – ClinicalTrials.gov”. clinicaltrials.gov. Retrieved 2017-03-24. Jump up^ “Efficacy and Safety Study of DX-2930 to Prevent Acute Angioedema Attacks in Patients With Type I and Type II HAE – Full Text View – ClinicalTrials.gov”. clinicaltrials.gov. Retrieved 2017-03-24. Jump up^ “Long-term Safety and Efficacy Study of DX-2930 to Prevent Acute Angioedema Attacks in Patients With Type I and Type II HAE – Full Text View – ClinicalTrials.gov”. clinicaltrials.gov. Retrieved 2017-03-24. Jump up^ “Lanadelumab – AdisInsight”. adisinsight.springer.com. Retrieved 2017-03-24. Jump up^ “Dyax Corp. Receives FDA Breakthrough Therapy Designation for DX-2930 for Prevention of Attacks of Hereditary Angioedema”. http://www.businesswire.com. Retrieved 2017-03-24. The FDA’s approval of Fulphila is based on review of evidence that included extensive structural and functional characterization, animal study data, human pharmacokinetic and pharmacodynamic data, clinical immunogenicity data, and other clinical safety and effectiveness data that demonstrates Fulphila is biosimilar to Neulasta. Fulphila has been approved as a biosimilar, not as an interchangeable product. The most common side effects of Fulphila are bone pain and pain in extremities. Patients with a history of serious allergic reactions to human granulocyte colony-stimulating factors such as pegfilgrastim or filgrastim products should not take Fulphila. Serious side effects from treatment with Fulphila include rupture of the spleen, acute respiratory distress syndrome, serious allergic reactions including anaphylaxis, acute inflammation of the kidney (glomerulonephritis), an abnormally high level of white blood cells (leukocytosis), capillary leak syndrome and the potential for tumor growth. Fatal sickle cell crises have occurred. The FDA granted approval of Fulphila to Mylan GmbH. Crysvita (burosumab-twza) is a fibroblast growth factor 23 (FGF23) blocking antibody. This drug is indicated for the treatment of X-linked hypophosphatemia with radiological evidence of bone disease in children of 1 year of age and older and adolescents with growing skeletons . Burosumab (INN, trade name Crysvita) known as KRN23 is a human monoclonal antibody designed for the treatment of X-linked hypophosphatemia. 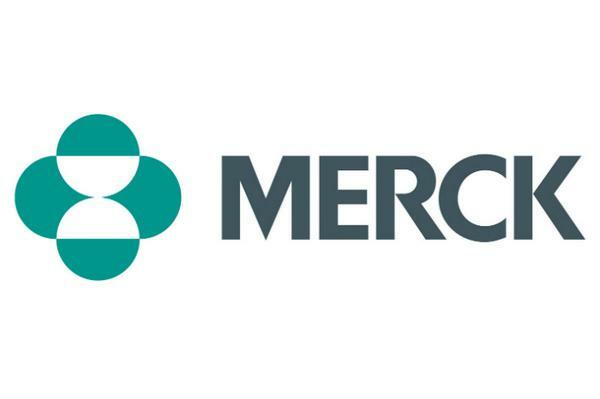 Burosumab was approved by the FDA for its intended purpose, in patients aged 1 year and older, on 17 April 2018. The FDA approval fell under both the breakthrough therapy and orphan drug designations. This drug was developed by Ultragenyx and is in a collaborative license agreement with Kyowa Hakko Kirin. 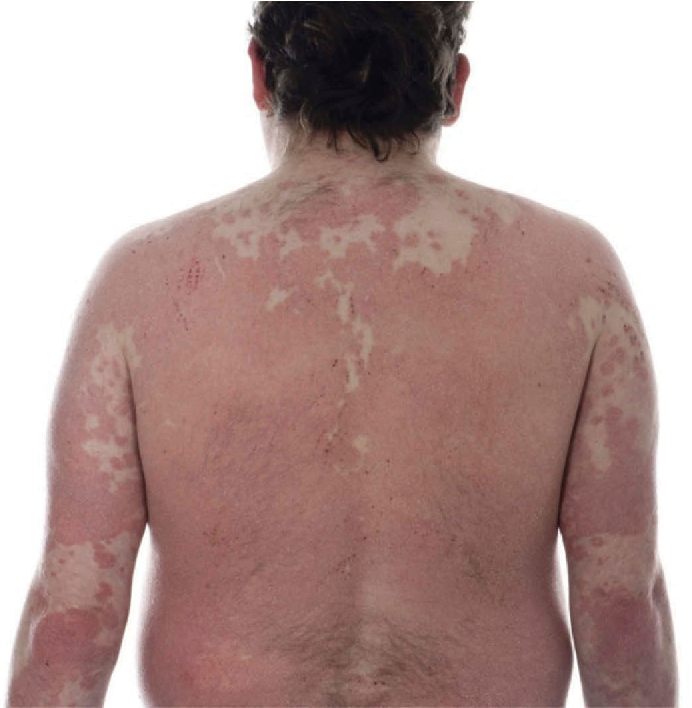 Burosumab (KRN23) is an entirely human monoclonal IgG1 antibody that binds excess fibroblast growth factor 23 (FGF23) and has been successfully tested in clinical trials in children with X-linked hypophosphatemic rickets . The U.S. Food and Drug Administration approved Crysvita (burosumab) in April 2018. This is the first drug approved to treat adults and children ages 1 year and older with X-linked hypophosphatemia (XLH), which is a rare, inherited form of rickets. X-linked hypophosphatemia causes low circulating levels of phosphorus in the blood. It causes impaired bone growth and development in children and adolescents and issues with bone mineralization throughout a patient’s life . Crysvita is specifically indicated for the treatment of X-linked hypophosphatemia (XLH) in adult and pediatric patients 1 year of age and older. Crysvita is supplied as a subcutaneous injection. The recommended starting dose for pediatrics is 0.8 mg/kg of body weight, rounded to the nearest 10 mg, administered every two weeks. The minimum starting dose is 10 mg up to a maximum dose of 90 mg. After initiation of treatment with Crysvita, measure fasting serum phosphorus every 4 weeks for the first 3 months of treatment, and thereafter as appropriate. If serum phosphorus is above the lower limit of the reference range for age and below 5 mg/dL, continue treatment with the same dose. Follow dose adjustment schedule per the drug label. The recommended dose regimen in adults is 1 mg/kg body weight, rounded to the nearest 10 mg up to a maximum dose of 90 mg, administered every four weeks. After initiation of treatment with Crysvita, assess fasting serum phosphorus on a monthly basis, measured 2 weeks post-dose, for the first 3 months of treatment, and thereafter as appropriate. If serum phosphorus is within the normal range, continue with the same dose. See drug label for specific dose adjustments. Crysvita (burosumab-twza) is a fibroblast growth factor 23 (FGF23) blocking antibody. X-linked hypophosphatemia is caused by excess fibroblast growth factor 23 (FGF23) which suppresses renal tubular phosphate reabsorption and the renal production of 1,25 dihydroxy vitamin D. Burosumab-twza binds to and inhibits the biological activity of FGF23 restoring renal phosphate reabsorption and increasing the serum concentration of 1,25 dihydroxy vitamin D.
Jump up^ World Health Organization (2016). “International Nonproprietary Names for Pharmaceutical Substances (INN). Proposed INN: List 115”(PDF). WHO Drug Information. 30 (2): 255. Jump up^ “Burosumab (KRN23) for X-Linked Hypophosphatemia (XLH)” (PDF). n.d. Retrieved 2018-04-18. ^ Jump up to:a b “FDA approves first therapy for rare inherited form of rickets, x-linked hypophosphatemia” (Press release). FDA. 17 April 2018. Jump up^ “Collaboration with Ultragenyx to Develop and Commercialize KRN23 for X-linked Hypophosphatemia” (Press release). Kyowa Kirin. 4 September 2013. Retrieved 2018-04-17. The U.S. Food and Drug Administration today expanded the approved use of Nucala (mepolizumab) to treat adult patients with eosinophilic granulomatosis with polyangiitis (EGPA), a rare autoimmune disease that causes vasculitis, an inflammation in the wall of blood vessels of the body. This new indication provides the first FDA-approved therapy specifically to treat EGPA. Continue reading. The U.S. Food and Drug Administration today expanded the approved use of Nucala (mepolizumab) to treat adult patients with eosinophilic granulomatosis with polyangiitis (EGPA), a rare autoimmune disease that causes vasculitis, an inflammation in the wall of blood vessels of the body. This new indication provides the first FDA-approved therapy specifically to treat EGPA. According to the National Institutes of Health, EGPA (formerly known as Churg-Strauss syndrome) is a condition characterized by asthma, high levels of eosinophils (a type of white blood cell that helps fight infection), and inflammation of small- to medium-sized blood vessels. The inflamed vessels can affect various organ systems including the lungs, gastrointestinal tract, skin, heart and nervous system. It is estimated that approximately 0.11 to 2.66 new cases per 1 million people are diagnosed each year, with an overall prevalence of 10.7 to 14 per 1,000,000 adults. The FDA granted this application Priority Review and Orphan Drug designations. Orphan Drug designation provides incentives to assist and encourage the development of drugs for rare diseases. Nucala was previously approved in 2015 to treat patients age 12 years and older with a specific subgroup of asthma (severe asthma with an eosinophilic phenotype) despite receiving their current asthma medicines. Nucala is an interleukin-5 antagonist monoclonal antibody (IgG1 kappa) produced by recombinant DNA technology in Chinese hamster ovary cells. Nucala is administered once every four weeks by subcutaneous injection by a health care professional into the upper arm, thigh, or abdomen. The safety and efficacy of Nucala was based on data from a 52-week treatment clinical trial that compared Nucala to placebo. Patients received 300 milligrams (mg) of Nucala or placebo administered subcutaneously once every four weeks while continuing their stable daily oral corticosteroids (OCS) therapy. Starting at week four, OCS was tapered during the treatment period. The primary efficacy assessment in the trial measured Nucala’s treatment impact on disease remission (i.e., becoming symptom free) while on an OCS dose less than or equal to 4 mg of prednisone. Patients receiving 300 mg of Nucala achieved a significantly greater accrued time in remission compared with placebo. A significantly higher proportion of patients receiving 300 mg of Nucala achieved remission at both week 36 and week 48 compared with placebo. In addition, significantly more patients who received 300 mg of Nucala achieved remission within the first 24 weeks and remained in remission for the remainder of the 52-week study treatment period compared with patients who received the placebo. The most common adverse reactions associated with Nucala in clinical trials included headache, injection site reaction, back pain, and fatigue. Nucala should not be administered to patients with a history of hypersensitivity to mepolizumab or one of its ingredients. It should not be used to treat acute bronchospasm or status asthmaticus. Hypersensitivity reactions, including anaphylaxis, angioedema, bronchospasm, hypotension, urticaria, rash, have occurred. Patients should discontinue treatment in the event of a hypersensitivity reaction. Patients should not discontinue systemic or inhaled corticosteroids abruptly upon beginning treatment with Nucala. Instead, patients should decrease corticosteroids gradually, if appropriate. Health care providers should treat patients with pre-existing helminth infections before treating with Nucala because it is unknown if Nucala would affect patients’ responses against parasitic infections. In addition, herpes zoster infections have occurred in patients receiving Nucala. Health care providers should consider vaccination if medically appropriate. The FDA granted approval of Nucala to GlaxoSmithKline. Gemtuzumab ozogamicin (marketed by Wyeth as Mylotarg) is a drug-linked monoclonal antibody (an antibody-drug conjugate) that was used to treat acute myelogenous leukemia from 2000 to 2010. It was withdrawn from market in June 2010 when a clinical trial showed the drug increased patient death and added no benefit over conventional cancer therapies. Gemtuzumab is a monoclonal antibody to CD33 linked to a cytotoxic agent from the class of calicheamicins. CD33 is expressed in most leukemic blast cells but also in normal hematopoietic cells, the intensity diminishing with maturation of stem cells. Common side effects of administration included shivering, fever, nausea and vomiting. Serious side effects included severe myelosuppression (suppressed activity of bone marrow, which is involved in formation of various blood cells [found in 98% of patients]), disorder of the respiratory system, tumor lysis syndrome, Type III hypersensitivity, venous occlusion, and death. Gemtuzumab ozogamicin was created in a collaboration between Celltech and Wyeth that began in 1991. The same collaboration later produced inotuzumab ozogamicin. Celltech was acquired by UCB in 2004 and Wyeth was acquired by Pfizer in 2009. In the United States, it was approved under an accelerated-approval process by the FDA in 2000 for use in patients over the age of 60 with relapsed acute myelogenous leukemia (AML); or those who are not considered candidates for standard chemotherapy. The accelerated approval was based on the surrogate endpoint of response rate. It was the first antibody-drug conjugate to be approved. Within the first year after approval, the FDA required a black box warning be added to Gemtuzumab packaging. The drug was noted to increase the risk of veno-occlusive disease in the absence of bone marrow transplantation. Later the onset of VOD was shown to occur at increased frequency in Gemtuzumab patients even following bone marrow transplantation. The drug was discussed in a 2008 JAMA article, which criticized the inadequacy of postmarketing surveillance of biologic agents. A randomized phase 3 comparative controlled trial (SWOG S0106) was initiated in 2004 by Wyeth in accordance with the FDA accelerated-approval process. The study was stopped[when?] prior to completion due to worrisome outcomes. Among the patients evaluated for early toxicity, fatal toxicity rate was significantly higher in the gemtuzumab combination therapy group vs the standard therapy group. Mortality was 5.7% with gemtuzumab and 1.4% without the agent (16/283 = 5.7% vs 4/281 = 1.4%; P = .01). In June 2010, Pfizer withdrew Mylotarg from the market at the request of the US FDA. However, some other regulatory authorities did not agree with the FDA decision, with Japan’s Pharmaceuticals and Medical Devices Agency stating in 2011 that the “risk-benefit balance of gemtuzumab ozogamicin has not changed from its state at the time of approval”. Jump up^ “Mylotarg”. Informa Biomedtracker. Retrieved 19 August 2017. Jump up^ Niculescu-Duvaz, I (December 2000). “Technology evaluation: gemtuzumab ozogamicin, Celltech Group.”. Current opinion in molecular therapeutics. 2 (6): 691–6. PMID 11249747. Jump up^ Damle, NK; Frost, P (August 2003). “Antibody-targeted chemotherapy with immunoconjugates of calicheamicin.”. Current opinion in pharmacology. 3 (4): 386–90. PMID 12901947. doi:10.1016/S1471-4892(03)00083-3. Jump up^ “Celltech sold to Belgian firm in £1.5bn deal”. The Guardian. 18 May 2004. Jump up^ Sorkin, Andrew Ross; Wilson, Duff (25 January 2009). “Pfizer Agrees to Pay $68 Billion for Rival Drug Maker Wyeth”. The New York Times. Jump up^ Bross PF, Beitz J, Chewn G, Chen XH, Duffy E, Kieffer L, Roy S, Sridhara R, Rahman A, Williams G, Pazdur R (2001). “Approval summary: gemtuzumab ozogamicin in relapsed acute myeloid leukemia.”. Clin Cancer Res. 7 (6): 1490–6. PMID 11410481. ^ Jump up to:a b Stanton, Dan (February 1, 2017). “Pfizer resubmits US and EU application for withdrawn ADC Mylotarg”. BioPharma Reporter. Jump up^ Giles FJ, Kantarjian HM, Kornblau SM, Thomas DA, Garcia-Manero G, Waddelow TA, David CL, Phan AT, Colburn DE, Rashid A, Estey EH (2001). “Mylotarg (gemtuzumab ozogamicin) therapy is associated with hepatic venoocclusive disease in patients who have not received stem cell transplantation.”. Cancer. 92 (2): 406–13. PMID 11466696. doi:10.1002/1097-0142(20010715)92:2<406::AID-CNCR1336>3.0.CO;2-U. Jump up^ Wadleigh M, Richardson PG, Zahrieh D, Lee SJ, Cutler C, Ho V, Alyea EP, Antin JH, Stone RM, Soiffer RJ, DeAngelo DJ (2003). “Prior gemtuzumab ozogamicin exposure significantly increases the risk of veno-occlusive disease in patients who undergo myeloablative allogeneic stem cell transplantation.”. Blood. 102 (5): 1578–82. PMID 12738663. doi:10.1182/blood-2003-01-0255. Jump up^ Pharmaceuticals and Medical Devices Safety Information, No. 277, February 2011 (PDF) (Technical report). Pharmaceuticals and Medical Devices Agency of Japan. 2011. Kymriah is a genetically-modified autologous T-cell immunotherapy. Each dose of Kymriah is a customized treatment created using an individual patient’s own T-cells, a type of white blood cell known as a lymphocyte. The patient’s T-cells are collected and sent to a manufacturing center where they are genetically modified to include a new gene that contains a specific protein (a chimeric antigen receptor or CAR) that directs the T-cells to target and kill leukemia cells that have a specific antigen (CD19) on the surface. Once the cells are modified, they are infused back into the patient to kill the cancer cells. Because of the risk of CRS and neurological events, Kymriah is being approved with a risk evaluation and mitigation strategy (REMS), which includes elements to assure safe use (ETASU). The FDA is requiring that hospitals and their associated clinics that dispense Kymriah be specially certified. As part of that certification, staff involved in the prescribing, dispensing, or administering of Kymriah are required to be trained to recognize and manage CRS and neurological events. Additionally, the certified health care settings are required to have protocols in place to ensure that Kymriah is only given to patients after verifying that tocilizumab is available for immediate administration. The REMS program specifies that patients be informed of the signs and symptoms of CRS and neurological toxicities following infusion – and of the importance of promptly returning to the treatment site if they develop fever or other adverse reactions after receiving treatment with Kymriah. An anti-CD38 monoclonal antibody used to treat multiple myeloma. Daratumumab (Darzalex) is an anti-cancer drug. It binds to CD38. Daratumumab was originally developed by Genmab, but it is now being jointly developed by Genmab along with the Johnson & Johnson subsidiary Janssen Biotech, which acquired worldwide commercialization rights to the drug from Genmab. Encouraging preliminary results were reported in June 2012 from a Phase 1/2 clinical trial in relapsed multiple myeloma patients.Updated trial results presented in December 2012 indicate daratumumab is continuing to show promising single-agent anti-myeloma activity. A 2015 study compared monotherapy 8 and 16mg/kg at monthly to weekly intervals. In November 2015, the U.S. Food and Drug Administration approved daratumumab for treatement of multiple myeloma. Daratumumab can also bind to CD38 present on red blood cells and interfere with antibody testing. Patients will show a panreactive antibody panel, including a positive auto-control. Treatment of the antibody panel cells with dithiothreitol (DTT) and repeating testing will effectively negate the binding of daratumumab to CD38 on the RBC surface; however, DTT also inactivates/destroys many antigens on the RBC surface by disrupting disulfide bonds. Fortunately, the only antigen system affected that is associated with common, clinically significant antibodies is Kell, making K-negative RBCs a reasonable alternative when urgent transfusion is indicated. 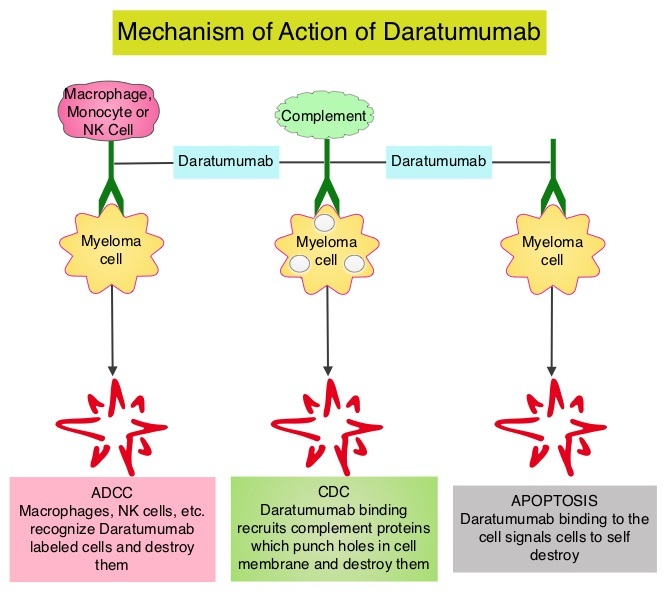 Daratumumab is a human IgG1k monoclonal antibody (mAb) that binds with high affinity to the CD38 molecule, which is highly expressed on the surface of multiple myeloma cells. It is believed to induce rapid tumor cell death through programmed cell death, or apoptosis, and multiple immune-mediated mechanisms, including complement-dependent cytotoxicity, antibody-dependent cellular phagocytosis and antibody-dependent cellular cytotoxicity. Daratumumab is approved in the United States for the treatment of patients with multiple myeloma who have received at least three prior lines of therapy, including a proteasome inhibitor (PI) and an immunomodulatory agent, or who are double-refractory to a PI and an immunomodulatory agent. In May 2013, daratumumab received Fast Track Designation and Breakthrough Therapy Designation from the US FDA for the treatment of patients with multiple myeloma who have received at least three prior lines of therapy including a PI and an immunomodulatory agent or who are double refractory to a PI and an immunomodulatory agent. Breakthrough Therapy Designation is a program intended to expedite the development and review of drugs to treat serious or life-threatening diseases in cases where preliminary clinical evidence shows that the drug may provide substantial improvements over available therapy. Daratumumab has also received Orphan Drug Designation from the US FDA and the EMA for the treatment of multiple myeloma. Five Phase III clinical studies with daratumumab in relapsed and frontline settings are currently ongoing. Additional studies are ongoing or planned to assess its potential in other malignant and pre-malignant diseases on which CD38 is expressed, such as smoldering myeloma and non-Hodgkin’s lymphoma. Genmab announced a global license and development agreement for daratumumab with Janssen Biotech, Inc. in August 2012. The agreement became effective in September 2012. Stringent complete response (sCR) was reported in 2.8 percent of patients, very good partial response (VGPR) was reported in 9.4 percent of patients, and partial response (PR) was reported in 17 percent of patients.1 These efficacy results were based on ORR as determined by the Independent Review Committee assessment using IMWG (International Myeloma Working Group) criteria and the range for median duration of response. In August 2012, Janssen Biotech, Inc. and Genmab A/S entered a worldwide agreement, which granted Janssen an exclusive license to develop, manufacture and commercialize DARZALEX.13 Janssen is currently the global sponsor of all but one clinical study. 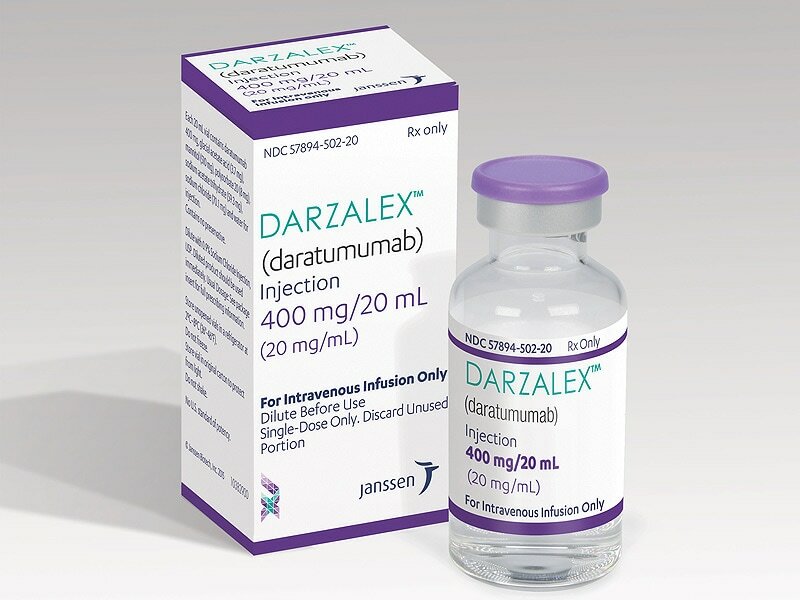 DARZALEX will be commercialized in the U.S. by Janssen Biotech, Inc.
DARZALEX (daratumumab) injection for intravenous infusion will be available for distribution in the U.S. within two weeks following FDA approval. Janssen Biotech offers comprehensive access and support information, resources and services to assist U.S. patients in gaining access to DARZALEX through the Janssen CarePath Program. For more information, health care providers or patients can contact: 1-844-55DARZA (1-844-553-2792). Information will also be available at www.DARZALEX.com. Dedicated case coordinators are available to work with both healthcare providers and patients. Patients with private or commercial insurance may be eligible for the Janssen CarePath Savings Program for DARZALEX. Information on the enrollment process will be available online at www.darzalex.com/access-and-cost-support#affordability. DARZALEX® (daratumumab) injection for intravenous infusion is indicated for the treatment of patients with multiple myeloma who have received at least three prior lines of therapy, including a proteasome inhibitor (PI) and an immunomodulatory agent, or who are double-refractory to a PI and an immunomodulatory agent.1 This indication is approved under accelerated approval based on response rate. Continued approval for this indication may be contingent upon verification and description of clinical benefit in confirmatory trials. DARZALEX is the first human anti-CD38 monoclonal antibody (mAb) to receive U.S. Food and Drug Administration (FDA) approval to treat multiple myeloma. DARZALEX is believed to induce tumor cell death through apoptosis, in which a series of molecular steps in a cell lead to its death1,10 and multiple immune-mediated mechanisms of action, including complement-dependent cytotoxicity (CDC), antibody-dependent cellular cytotoxicity (ADCC) and antibody-dependent cellular phagocytosis (ADCP).1,8 More information will be available atwww.DARZALEX.com. World Health Organization (2009). “International Nonproprietary Names for Pharmaceutical Substances (INN). Proposed INN: List 101” (PDF). WHO Drug Information 23 (2). “‘Janssen Biotech Announces Global License and Development Agreement for Investigational Anti-Cancer Agent Daratumumab'”. Janssen Biotech. Retrieved 2013-01-31. “ASCO: Drug Shows Promise in Myeloma”. MedPage Today. “‘Daratumumab Continues To Show Promise For Relapsed/Refractory Myeloma Patients (ASH 2012)'”. The Myeloma Beacon. Retrieved 2013-01-31. Lokhorst, Henk M.; Plesner, Torben; Laubach, Jacob P.; Nahi, Hareth; Gimsing, Peter; Hansson, Markus; Minnema, Monique C.; Lassen, Ulrik; Krejcik, Jakub (2015-09-24). “Targeting CD38 with Daratumumab Monotherapy in Multiple Myeloma”. The New England Journal of Medicine 373 (13): 1207–1219. doi:10.1056/NEJMoa1506348. ISSN 1533-4406. PMID 26308596. Chapuy, CI; Nicholson, RT; Aguad, MD; Chapuy, B; Laubach, JP; Richardson, PG; Doshi, P; Kaufman, RM (June 2015). “Resolving the daratumumab interference with blood compatibility testing.”. Transfusion 55 (6 Pt 2): 1545–54. PMID 25764134.